If you like sand, you have found your spot. 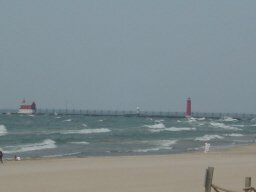 The Grand Haven State Park Beach sits on 48 acres and almost all of it is sand with a beautiful beach. The beach is easily reachable by a nice drive down Harbor Avenue but I usually pry my family away from shopping and take the riverwalk. The riverwalk has plenty of places to stop and plenty of things to watch, like our two favorites: people and boats. Keep walking down the beach (it is quite big) and you will run into the concession stands/restrooms, etc. 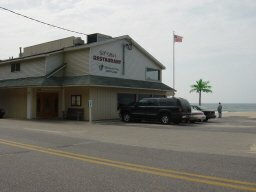 And for those who are really into their workout for the day you can continue down the beach and hit the Bil Mar. But as our family always says, you can’t beat the scenery and there is no reason to hurry, so might as well take in what we can. We see enough of the car when we are not on vacation. I hope you enjoy Grand Haven State Park beach as much as we do. 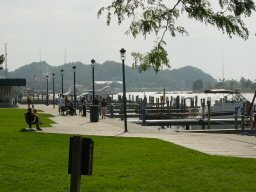 It really is part of what makes Grand Haven one of our favorite Beach Towns!